Steel-Polished and Plated or Bonderized and Prime Coated for Painting. •For medium weight doors receiving medium frequency service. •Concealed bearing for trouble free long life application. •Hole in bottom tip for easy pin removal. •Attractive slim barrel with flush pins and plugs. •May be used on fire rated openings. •3-1/2”, 4” available in square, 5/8” and 1/4” Radius Round Corners. •All hinges are ANSI template. GENERAL PRODUCT INFORMATION: PBB, Inc. template hinges are manufactured to close tolerances and meet all specifications and requirements set by the American National Standards Institute (ANSI). 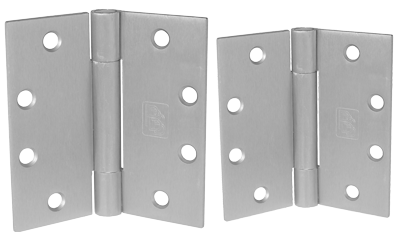 HINGE SWAGING: A standard swaging of our standard weight full mortise hinge when closed to parallel position provides a 1/16” clearance between leaves. .130 ± .005 for 4” x 4” Template screw hole locations for all 3-1/2” x 3-1/2” full mortise template butts are punched to commercial standard CS9-65. One hinge per plastic bag, 3 hinges and 1 screw pack per unit carton. 16 unit cartons or 48 hinges per master shipping carton. 1 screw pack includes all machine screws (24), and 1/2 wood screws (12). ATMS & AWS also available. For 3-1/2 x 3-1/2, 1 screw pack includes (18) machine screws and (18) wood screws.